Our pineapple biscuits' filling is fully enclosed within a rectangular shortcrust pastry. We can guarantee that one just can't stop eating them. 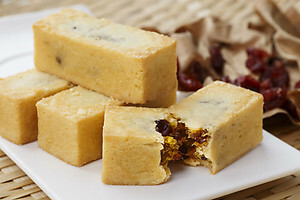 Besides our traditional pineapple biscuits, we also have Cranberry Pineapple biscuits, which are a mixture of cranberries with the pineapple jam to give customers a new and different way of taking pineapple biscuits. For durian lovers, we also offer another distinct taste of the shortcrust pastry with our durian filling.Sophisticated yet funky, durian pastries have become more popular than eating the durian itself. 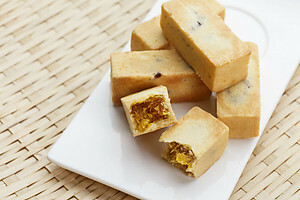 You will still get the creamy and satisfactory taste of the fruit with our Durian biscuits.